Cerys Matthews is to be Artistic Director for the Opening Concert of the world music exposition Womex 13 in Cardiff later on this year. The concert will celebrate the start of five days full to bursting with music, networking and cultural exchange between musicians, agents and promoters from across the world. 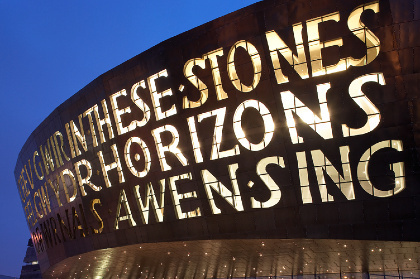 Womex (the world music industry's single most important organisation and exposition) is to be staged in Wales this year, the first time ever, and will play host to all the movers and shakers of the global world music scene. Traditionally the first night of the four day exposition is given over to the host country (in this case Wales, not the UK) to showcase the immense musical talent of the Welsh nation. "This is not just about looking back, it is also about looking forward but with a reverence to the roots of music from Wales. I've long celebrated these traditions through my own music, writing and broadcasting work, but when the opportunity arose to create a stage performance with the aim of placing Wales in its rightful place among the great traditions of the world, I jumped at the chance." The singer/songwriter, multi-instrumentalist, author and broadcaster will oversee a concert that will be a journey through Wales's indigenous musical heritage, now blended with contemporary and world forms. Welsh music has been fusing musical traditions since the Iron Age, when the Celts arrived on Welsh shores. Its songs and instruments have been influenced by the Romans, Saxons, Normans, Romany, and the innumerable cultures who arrived during the Industrial Revolution. Matthews further stated the WOMEX Opening Concert: "will take Wales's culture and music further, putting it firmly on the world map." The announcement of Matthews's appointment today lands on the birthday of Lady Llanofer, who was renowned for collecting Welsh folk tunes during the 19th century. “It will be a journey through the ancestral DNA of our music, the deep traditions forged in myth and melody further back than we can possibly remember. The concert will take place at Wales Millennium Centre's Donald Gordon Theatre on the evening of Wednesday, 23 October 2013. 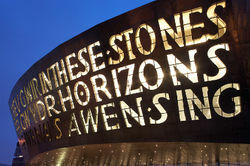 Womex will be staged in Cardiff from October 23rd to 27th. The Welsh capital beat off competition from Glasgow and Dublin to host the event following a successful campaign spearheaded by Cerdd Cymru: Music Wales. There will be around 60 concerts featuring more than 300 artists and a trade fair exhibiting up to 650 companies from more than 90 countries. Performances will take place at the Wales Millennium Centre and Cardiff Motorpoint Arena. WOMEX 13 Cardiff is hosted by Cerdd Cymru: Music Wales - a partnership between Arts Council of Wales/ Wales Arts International and Welsh Music Foundation.